In the framework of knowledge based and the globalization of economy, universities play an increasing role in technology innovation and entrepreneurship and contribute in a decisive manner to the creation of very high added value wealth and jobs in modern economies and societies. The second International Workshop on Technology Innovation and Entrepreneurship (iWTIE�14) is a platform to promote research, development and innovation activities in Moroccan universities and engineering schools and to help them transform these activities into innovative products and services with strong impact and added value for the national economy and its social welfare. IWTIE�14 is also a very important occasion to explore new business opportunities, and to strengthen synergies among academia, industry, government and civil society in order to develop and bring to the market innovative and competitive technological products and services which present very a high added value for economy, industry and the citizens at the national and international levels. IWTIE�14 is organized by National Higher School of Information technology and Systems Analysis (ENSIAS) and Mohammed V Souissi University in collaboration with Intel and in partnership with many other institutions from industry, academia and government from Morocco and from abroad. 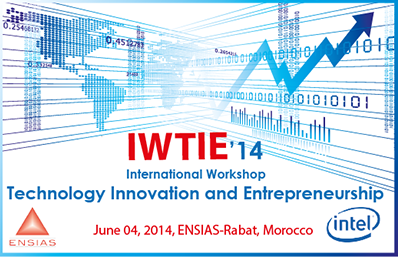 IWTIE�14 is jointly organized with different other events scheduled in the framework of Innovation Week 2014 (iWeek�14), namely, the national entrepreneurship competition � Morocco Intel Business Plan Competition �, Intel Training of Trainers in Entrepreneurship, Mobile Apps Competition and Robotics Competition. Entrepreneurial universities and academia-industry collaboration. Researchers, engineers, PhD and Master Students interested to innovation.